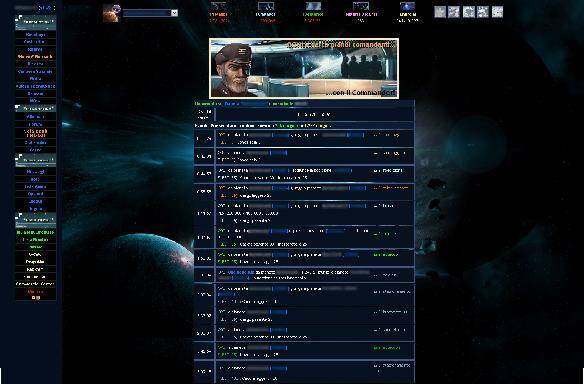 Ogame is a Free to play MMORPG Space Management Strategy genre game developed by GameForge for Internet Browser plataform. In Ogame players take on the role of a rising Emperor with full authority on the planet that you control including its resources, military and infrastructure. The game is a browser-based space themed Empire management strategy where you will rise up along thousands of other Emperors and try to claim dominance over the known Universe. To be successful in the game careful management of your resources are needed, from your planet all research construction and missions are conducted and general development of your planet and Empire is done by using the various resources available. The three main resources are Crystal, Metal and Deuterium and these can be produced through your own mines, each mine producing a single, which can be upgraded to produce resources faster. To run your mines you will require an Energy resource which can be gathered by building various energy constructions such as solar plants, solar satellites or fusion reactors. Dark Matter is a unique resource in that it cannot be produced and instead players must send out their fleets on expeditions in search of it, this valuable resource is used to purchase officers or move an existing planet, and as such duties valuable nature is one of the things that can be purchased with premium currency. Combat in Ogame takes on a different format in comparison to other management strategy games in that players do not have constant control over their ship’s, simply choosing to send a ship to a destination via coordinates to either explore, defend or attack an enemy. When a ship reaches its destination the various stats and circumstances will determine the outcome of a number of rounds and players will then receive a battle report of what has occurred, meaning scouting ahead and preparation is key to survival in the game. Many players may choose to band together to form their own Alliance, in doing so you are guaranteed safety in numbers where your companion allies won’t attack you, can help defend you against enemies, rally together to form a raid on other planets or engage in trade amongst each other. Furthermore the Alliance Combat System can be used in some universes to help synchronise multiple fleets’ movement and cooperative missions, as well as the option to declare war or make peace with other rival Alliances.